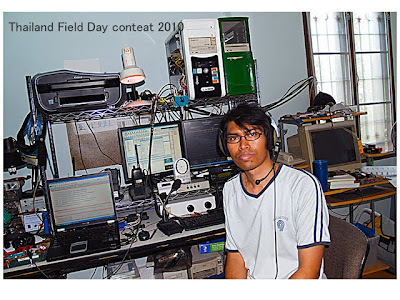 In last weekend (Feb 6) I have been to challenge in the TFDC2010.I setup my station for class D again. Class D is contest in the home station and a transmitter is not over 5 watts. For this year I am feeling bad again because this weekend I have working until I can made the points in 6 hours. So many problems for this contested. Working day, I can not completed set up homebrew antenna 4 sets of 7 elements and the noise in somewhere over my station. So I must improve my station again. For TFDC2010 has difference from last year. This year many Thai’s Ham was interested the contest more. Improve my station again see next contest. Why don't take the better station?